Social Media Strategy Frameworks: what about the metrics? The social web has created an ecosystem where off- and on-line businesses are rushing into blogs, social network pages, communities and other social media. When will organizations start taking a structured, holistic approach, rather than just pouring budgets into all cool ideas? While I have been on the outlook for such supportive frameworks during the previous weeks, the following three seems to be the most referred. The POST Method. Perhaps the most popularized framework as of today, the POST method by Groundswell describes a systematic approach to social strategy. POST is a acronym for People, Objectives, Strategy and Technology. The Three Spheres. Although Jeremiah Owyang applies the Three Spheres to web strategy in general, social media strategy could be considered a sub-set herein. The three spheres are the Community Sphere, the Business Sphere and the Technology Sphere. The Five S’s. Windmill Networking suggests five basic “S” concepts of social media marketing: Share, Support, Social, Strategy, and Sales. The figure’s colors show correlations among the components in the frameworks. Conceptually there is a technology component at the bottom, and a business/strategy one at the top. In the “middle”, there is a social-community component (often user-generated media) – the business logic that technology and strategy align with. Yet, there is room for more descriptive frameworks for managing social media strategy. With this middle layer I believe that time has come to revisit the true meaning of bubble-ish network effects and the “openness” as a part of every business model. This is the gist of user-generated content. Also, I’d prefer to add an additional layer, it be “M” for Metrics into “POSTM”. In the months and years to come, measurement will become a key activity and impetus to competitive advantage . While control migrates back to the demand-side (i.e. buyers of social media strategy), knowledge of metrics will become invaluable. As Thomas Davenports title suggests, is Competing on Analytics: The New Science of Winning? 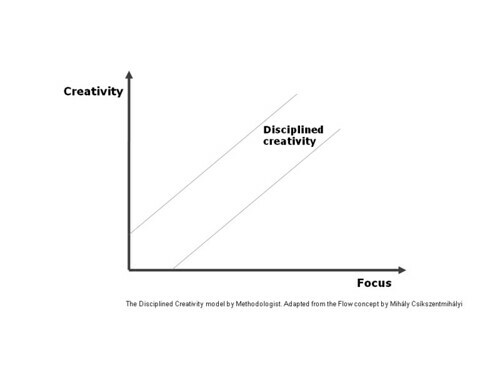 Disciplined Creativity: how to balance between creativity and focus? Innovation and entrepreneurship is subject to a fundamental paradox – the trade-off between creativity and focus. Many entrepreneurs are by nature creative individuals that must balance between glazing new ideas, products or features at the one hand, and execution and determinism at the other. The Disciplined Creativity idea is derived from the Flow concept by Mihály Csíkszentmihályi to help innovators reconcile creativity and discipline in parallel. The model will be elaborated in future posts. In the meantime, feedback on the idea is welcome. Iterative development, right?